So most of us are loving pompoms lately as we have put them on pillows, curtains, and remember Gaby's guest post here? 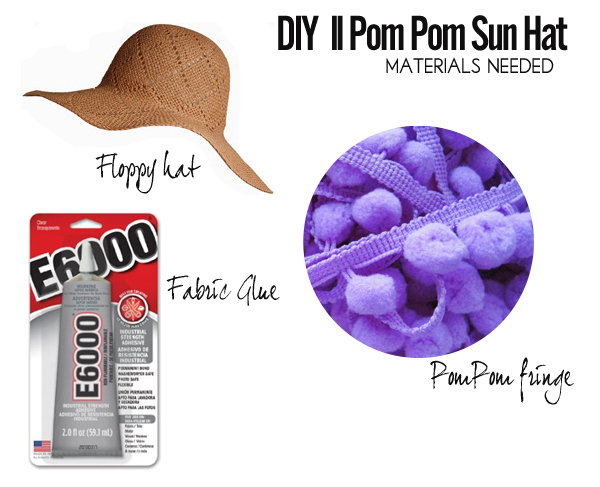 So, I figured we need a DIY to celebrate this little pompom obsession. 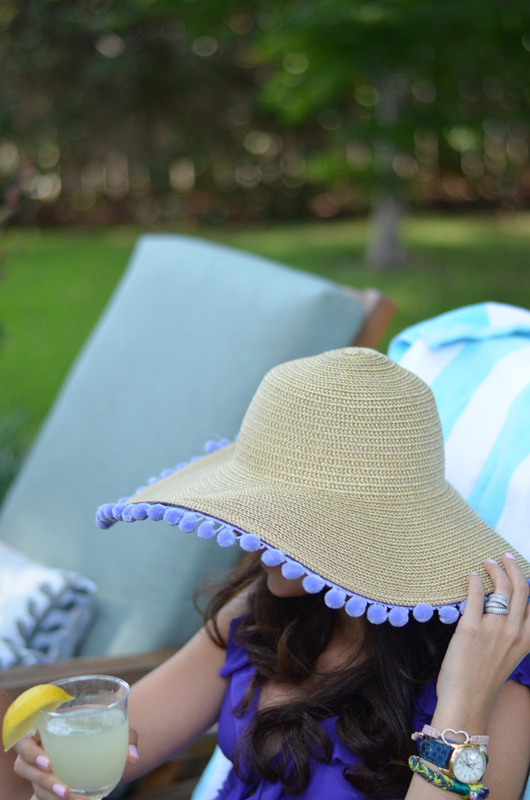 This fun sun hat is perfect for lazy summer days by the pool or beach and its so easy! 1 || Measure the amount of pompom fringe you need to go around the hat's brim and cut it. 2 || Little by little glue the inside edge of the hat's brim with fabric glue and start adding the fringe on top. Do this all the way around. 3 || Let the hat rest and put some weight all around the brim to make sure the glue sticks on tight. ( I just used some coffee table books). Easy peasey!! It makes any staycation so much more glamorous! How cute would it be to make these as favors for a little girl's pool party! I can think of so many wonderful color combinations to try! Let me know if you attempt it! I would love to see your end result! Omg this turned out so cute Albertina! LOVE. so fun! I love it! 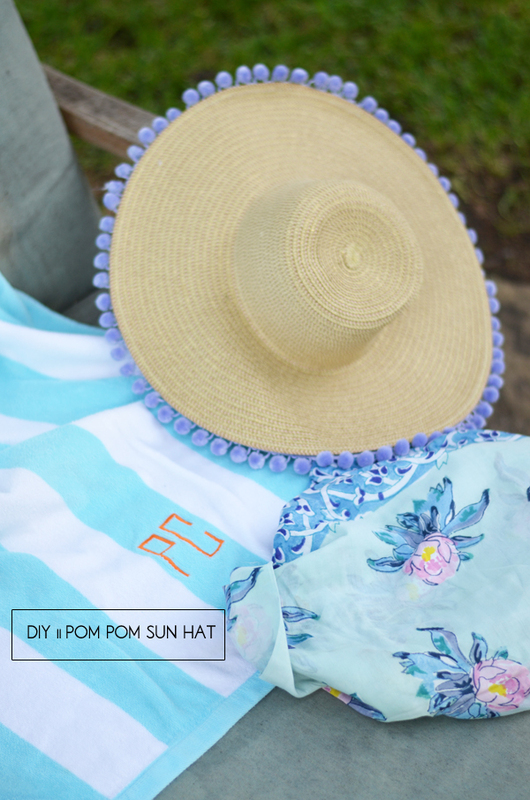 I might have to spruce up my sun hat with pom poms! Great job you look adorable!! I have just discovered your blog BTW and I love it! I'm hooked! Great job! You look adorable! I just discovered your blog BTW and i'm hooked! This is soooo adorable! So cute!! Love it, looks gooorgeous! This is just too cute!!! I think you chose the perfect colour of pom pom as well… Loving the pop of purple! Lindo trabajo Albertina, se nota que estas relax totallll,, que envidia y con una copita,,, je je,, jugo no es!!! How cute! Would be so fun to rock during a girls spa weekend or something! So fun, I love this idea! I have a niece who would pretty much freak out if I handed her one of these. Maybe this is one DIY she and I can do together. Very cute idea! So adorable. I would love to put pom poms on everything I own! i'm pom-pom obsessed so i just love this! great idea! I love the pom pom craze! Oh my gosh could you be any cuter....I love this idea!!! So perfect for summer! this is the cutest thing I've ever seen. Love it! I love everything Pom-Pom! I definitely want to try this...this is a super cool hat! How cute! What are you drinking. omg so cute. obsessed with pom poms lately! 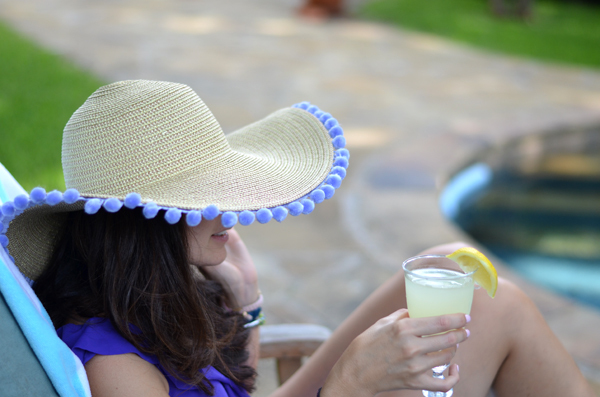 I really LOVE this pom pom hat! It's playful and cute - and simple - which is the only way I am going to do a DIY. Thanks for the inspiration! I'm so glad you linked to this in your post today because I'm down right OBSESSED! Must recreate this look!